Whenever I head to Las Vegas, I am always pleasantly surprised to see so many people playing Jackpot Party slots and especially, Jackpot Party progressives. These games are a true legend in Las Vegas gaming history. The thing I really like is that the bonus game is so simple, yet so incredibly popular still, after so many years - this game really has stolen the heart of the US in Vegas and now, the rest of the world too. Jackpot Party was one of the first video slot games to really capture the imagination of the Las Vegas casino players. A big reason for that, is because it was one of the first games to include a pick and choose bonus round. The Jackpot Party bonus round is so popular that it still exists, even in the most recent versions of the game. The bonus round is simple - you are presented with a whole screen of gifts and you pick one out. The gift is then opened up and whatever is inside, you get to keep (if it's a prize). Sometimes, though, you get a party pooper under the wrapping, which can stop the bonus round at once. Other times, though, you might get a reprieve - sometimes they give you a second chance, even though you picked the pooper. Other presents give out big multipliers, or take you through to a new screen of presents with even bigger prizes up for grabs. To play games like Jackpot Party for cash prizes, please visit our real money slots page - you can find a list of the best online casinos to play for cash. 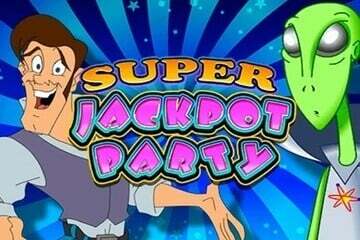 Our free version is the Super Jackpot Party game. You can play with no download and no need to register your details. If you find you run out of funds in the free version, simply reload the page and start again. You might also want to bookmark the page, so you can come back again and again. If you enjoy our free Jackpot Party slots, please don't forget to let the world know, by clicking the like buttons for Facebook or Google. If you go to Vegas at the moment and look around, you might be lucky enough to find the latest version of Jackpot Party (version 3). The new Jackpot Party game takes it to a whole new level - it is amazing, so look out for it. Unlike a lot of follow-up versions, the new Jackpot Party slots includes some wonderful innovations that make the game better, rather than detract from the qualities of the original.